Rebecca George is a Contemporary Mid-Career Painter who has maintained an active professional studio in Chicago, IL since 1993. Her work has evolved along a spectrum of figure-narratives to abstraction, focusing heavily on material and application method. The surfaces of George’s paintings are highly attended to with saturated, gestural compositions that are continuously pushing into new territory. 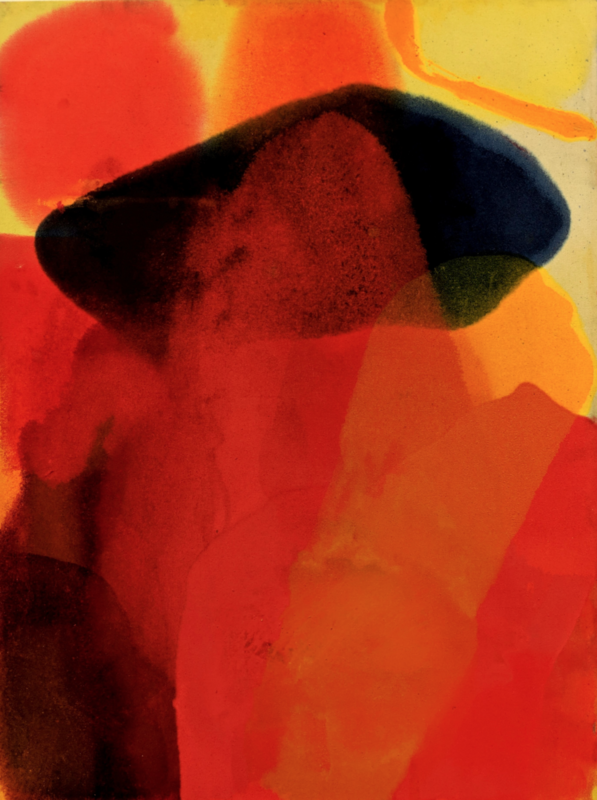 Her influences include Willem DeKooning, Helen Frankenthaler and Paul Gauguin. She maintains a rigorous exhibition and studio practice and is represented by The Art House Gallery. Her work is collected worldwide and she is well-published. She holds a BFA from Maryland, Institute, College of Art and MFA in Painting and Drawing from The School of the Art Institute of Chicago. Thank you for speaking with us today Rebecca, we’re looking forward to learning about your work as an artist and educator and gaining a deeper understanding of your creative process. Firstly, could you tell us about your work and the themes and topics you explore? Thank you for this opportunity to talk about my work. Over the last 5 years my painting went from being solely representational to an embracing of abstraction. It was a very significant and challenging shift. Working abstractly opened up painting for me in a fresh way, leading to curiosity and excitement over raw pigments, painting mediums, application methods and surfaces quality that were not bound to the forms of realism. And although I have worked large scale for many years, I started exploring 8’ and 9’ canvases, composing with pouring saturated stains and wet-into-wet oil painting. The desire to return to the figure in my work nagged me for about a year before I acted on it. These new pieces are all about family and demonstrate varying degrees of merging the abstract with recognizable form. Most recently, this has included building up the surface of the linen I paint on with very old and well worn burlap sacks I find on ebay along with other fabrics such as uncut lengths of hand woven, German linen dish towels that have a nubby texture. These collaged elements completely interrupt the otherwise predictable flow of a painted face/body. 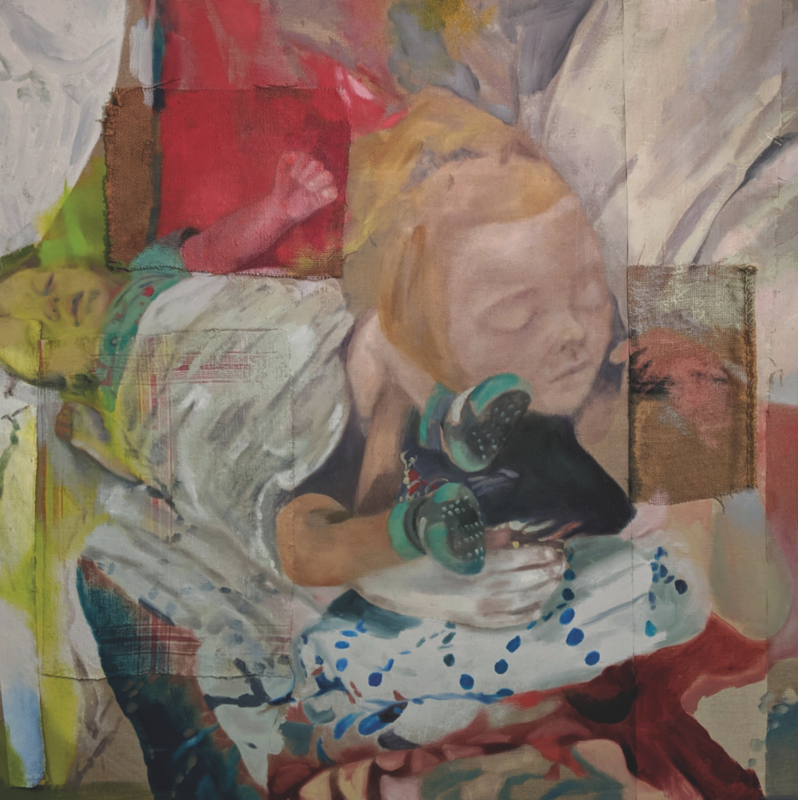 Because these surfaces “take” the paint so differently, the viewer has to kind of puzzle the image together to recognize the figures and their context. I continued to work abstractly throughout the return to the figure in painting and will typically have 2-4 large scale pieces (at least one figurative in nature) in progress at the same time. Both ways of working inform each other and provide me with a variety of ways to initiate, build and resolve pieces without being attached to the outcome. You have studied art extensively and built a successful following throughout your career, can you rewind for a moment and explain how your relationship with art began? Although no one in my family were visual artists, I was interested in drawing and color from a very young age. I was able to study more seriously when I was accepted to The Chicago Academy for the Arts, a very small private high school for performing and visual artists. It was my Dad who found out about the school and encouraged me to develop the application portfolio, which if I remember correctly, was about a week prior to their final interview deadline. I attended the Academy for my final 2 years during which time, I was immersed in college level arts and academic training. I pieced together the tuition with help from my Dad, summer long work study, part time jobs, donations from extended family and parents of fellow classmates. It’s really incredible how much support came through just when I needed it, giving me a start on pursuing my art as a lifelong career. I loved everything about the Academy: the small class sizes, the long hours, the commute downtown from my home on the far Southside of Chicago, and being taken seriously as an artist for the first time in my life. The Chair of the Visual Arts Department at that time was Mr. Glenn Rupert, who had cultivated relationships with art colleges throughout the United States. His attention to the future of his students and the quality of courses in his department is largely responsible for my receiving a full scholarship to attend Maryland Institute, College of Art. All these things had to happen to give me enough of a foundation to move forward. You are a versatile artist and your portfolio features work created in variety of painting styles. Can you tell us more about your decision to use a diverse range of painting techniques and media, as opposed to having a signature aesthetic? I think ultimately the reason for my insistence on working in multiple styles/techniques comes from having felt incredibly limited by working realistically for the first 16 years out of undergraduate school. Although by then I had lost interest in painting from photos, I hadn’t developed other ways of expressing content. My painting suffered. I embraced the willingness to start over, refusing to rely on those same techniques for making a painting. My work during that transition was tentative, lacking in confidence and sometimes quite sentimental. My need to expand what felt possible as ways of working fuelled me through those few years of redefining painting for myself. During that time, I came to understand that the inner critic had to be eliminated from my process. That originality could only be found by getting out of the way and letting painting paint. Having several pieces that focus on different materials and approaches in progress simultaneously helps me stay detached from the outcome and allows me to trust whatever direction I gravitate towards at any given time. No longer do I subject an idea to scrutiny or develop and execute preconceived plans for art making. I give myself plenty of permission to try my ideas, change direction in the middle of a piece, paint over a seemingly successful painting and maintain a relationship of curiosity with the work, balancing the notions of invention and discovery. My standard shifted from trying to make the best painting I can to needing to be fully engaged in the process and feeling connected to the work. You will be featuring three of your works in our directory Curatorial Volume.1: ‘Myth God Janus, 2018’, ‘Idem, 2018’ and ‘Inheritance, 2018’. We would love to know more about your creative process on these particular pieces. I’m very excited to be included in the upcoming directory. The 3 pieces that are featured in this publication represent the range in which I’m currently working: “Myth God Janus” was developed with a wet-into-wet oil painting technique that utilizes the linen surface as an element in the palette and composition. This piece is about finding balance in the coming and going/beginnings and endings evident in life. I utilized gesture, long attachments to extend my reach with the brush and high gloss mediums to contrast the applied oil paint from the Belgian linen. “Idem” was built exclusively by pouring oil paint thinned with solvent onto untreated canvas, staining the fibers and providing a very saturated surface. I had found that kerosene evaporates better than other oil based solvents as it dries, allowing for a much greater chromatic intensity. “Idem” utilizes this technique while welcoming chance, as there is always an element of surprise that accompanies pouring paint out of vessels and using gravity to build a painting. Lastly, “Inheritance” is part of a series of collaged grounds juxtaposed with representational portraits of family members. Utilizing a 35mm slide projector to preview/develop scale and placement variations, I identify a composition that will challenge me to hold the forms together visually by imposing them over collaged linen, burlap, and canvas. The projector is a great tool to work from in the early stages of a large scale painting that incorporates recognizable form. Having the image projected allows me to pick and choose shapes to include and alter the palette without having to trouble the surface with proportion fixes. This approach has a benefit of allowing me to add as little or as much paint to the variety of surfaces created by the collage, ultimately including unpainted sections as being as valid as painted ones. I complete the pieces without the projector, with the interest equally in the abstract properties as much as in the representational forms. Process is key in your work and you have highlighted that the fluidity involved in each step, between start to the final version of a single piece, can stand alone as part of a progression of work. You document the process and emphasise that no step is without value. Can you provide us with insight into this philosophy and why it is important to you? It doesn’t sound like much of a revelation, but the process of painting creates the painting. If I work wet-into-wet, utilize the rag to paint by removal, add addendum mediums to the paint, use paint I made from raw pigments or work on a primed or untreated surface, the choices in combination create the final version. Therefore I can’t separate how a painting is made from the painting itself. This for me simply means paying close attention to my choices and how everything is impacted once it is in a context. Exploring these options over many years of painting and teaching painting has given me valuable insights into all the incredible things paint can do. I’ve met a lot of painters who feel stuck and I’ve been there myself. The philosophy I’ve developed that highlights total engagement in process rather than outcome helps me continuously expand what is familiar and welcome the unknown. I find it to be a remedy for the “stuckness” I’ve experienced. You have over 25 years experience working as a professional artist. During this period your work has evolved in a number of ways. What have been the defining influences that have changed the trajectory of both your aesthetic and subjects? The first half of this time I spent attempting to master photorealism. I never did, of course. I had stuff going on the side of those very ambitious efforts, small drawings and collages for example, that expressed things about my daily life, such as relationships or the loss of a pet. But I didn’t take those seriously and kept pushing myself to complete large, multi-figure, social justice paintings that posed people in a context much like a theatre-stage. It took a long time before I recognized my personal content as valid enough to be in my main work. What followed was another longish bout with painting myself and exploring issues relating to my body, self image and loss. I remember really feeling frustrated that I was limited to the figure to talk about what I wanted to say, and to try ways of painting that I wanted to try. I began challenging this in my work by painting the figure then taking it out, painting across the torso or face as though it were just another shape. Several paintings later, I abandoned the figure altogether and thus began my relationship with abstraction. It’s interesting to point out that during this evolution, I started The Art House and was teaching painting almost daily to adults who were serious about their connection to painting as well. Every time I encountered/learned something exciting to me about materials, color, other artists, etc I had a direct and immediate sharing of it with my students. Their questions and interpretations, my responses and research, added up to further the momentum of all our work and created a real strong support for risk taking. Without having to be beholden to the figure, I leapt deeply into the vast possibilities of what is painting. I continue to be grateful for the teaching studio relationships that make up the community of The Art House. In the past year or so, the figure has made a come back in my work. A different branch of my practice, not yet as pliable with the infinite feeling abstract approaches, but sharing in the dialog that makes up my work. The Art House project also features an artists in residence programme which aims to support the development of emerging visual artists. Could you tell us about the artists you are working with this year? Ken Hogrefe’s work can be best characterized by his desire to push boundaries, not just his own but the very form that a “painting” needs to take. His output at The Art House has embraced multi-level paintings that at times wrap around the walls and floors of a studio or creep up onto the ceiling. Most recently his paintings have consisted of multiple panels that are integrated into a single, final piece that challenges standard approaches to composition and presentation. 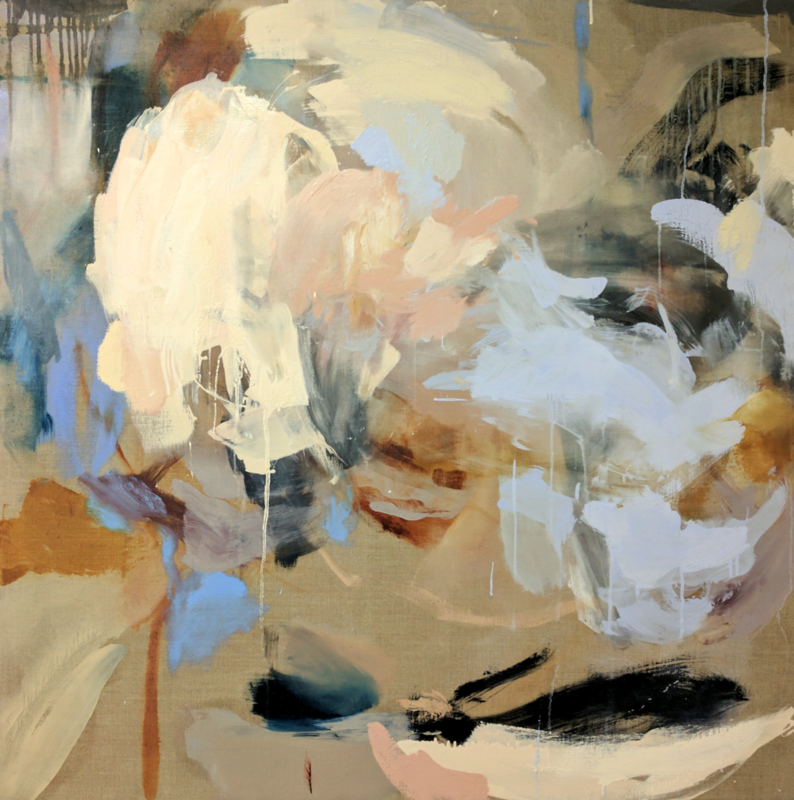 Ken’s work employs a wide range of mediums techniques and tools to create work that is at once abstract yet still accessible. 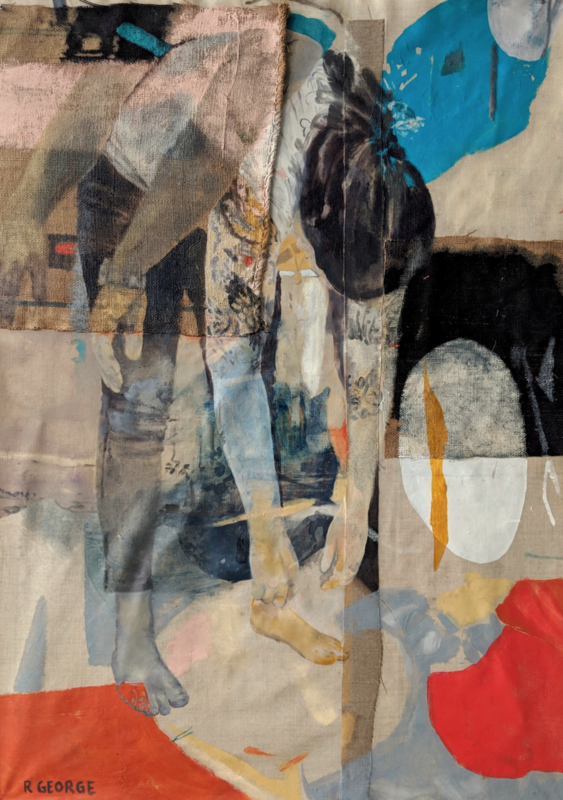 His latest paintings reference non-representational landscape (influenced by Diebenkorn and Mitchell) where color and its use becomes an emotional and narrative element. As the Senior Resident of The Art House, Ken’s practice has been greatly influenced by being around like minded artists and having their growth inspire and show him his own path to growth. See Ken's exhibition and publication history here. Jan Fayhee takes her inspiration from the natural world: sea, sky, weather, land. One of her ongoing series is titled “Landscape vs. Abstraction”. The majority of her work can be described this way, as it invites the viewer to experience shape, surface, and palette from a perspective that builds on the essence of landscape rather than the solid forms. In keeping with the philosophy of The Art House, Jan's emphasis is on materials and inviting the unknown in her creative process. “Materials have a mind of their own, “ Jan describes. “I do not know the answer for each particular painting. My interest is in the variations that occur while partnering with the nature of each material during the painting process.” Jan’s work spans many sizes and surface materials, often combining elements of acrylic: ink, heavy body, soft body, etc, with water and applications with brush, knife, rag and pours. See Jan’s exhibition and publication history here. Whilst developing your career, did you ever encounter any obstacles and what pushed you forward through those difficult moments? Once you began your studies in art, what plans did you have? Did you always envision becoming an educator as well as a professional artist? I did love teaching even from the first time I did it at age 18. I enrolled in an arts ed course in college and remember dropping it because the professor introduced the syllabus with a page describing “how to talk to little people” (referring to children). I decided I already knew how to do that and focused on art education as part time jobs, while using my degree program to take good advantage of their facilities in metal, ceramic, printmaking and fiber. I somehow knew I’d always be a painter, so I hardly took painting classes at all in my general fine arts curriculum. Seems contradictory to some, but perhaps I needed to figure painting out on my own. I cared about imparting the arts to my students and the satisfaction/reward from my jobs helped propel me through many obstacles, financial and otherwise. Always maintaining a studio is another important element -- even during times when I felt stuck and hardly went into the studio, which is a very painful thing, I maintained it, kept the door open and often looked inside the room. I have a lot of compassion for that suffering in people-- longing to enter the creative space and be free, but stopped short by the inner critic in its various forms. You have built an impressive and sizable community on Instagram, with over 106,000 followers! Can you share any tips for artists looking to develop their audience on this platform? I look at social media and my websites as my online face-- I think it’s important that you feel it is an honest face. The visual conversation we can have now with artists all over the world is incredible. Literally in my lifetime, my focus went from being almost entirely referencing historical artists to being aware of painting trends as they develop all across the globe. Before this technology artists had to be seen in person or already publicized with an audience to get on the radar of other living artists. It broadens the conversation immensely. I also really appreciate it when artists use social media to share their process, works in progress, and studio set up, not only framed, exhibited works. I appreciate when artists from around the world comment on something I’m working on. You can feel when there’s an authentic, relevant sharing going on, where artists are taking a genuine interest in other artists. You don’t have to know the person or speak the same language to take an interest and show support. I save a lot of images by other artists on platforms like Instagram and I share them with my students- almost equally a natural teaching tool as is my historical and contemporary art book collection in the studio. I think artists who genuinely engage, receive more engagement from their peers. Finally, we would love to know what your plans are for the future. Can you tell us what projects you have planned for 2019? I am in the process of rebuilding TheArtHouse.us website to include live auctions in our online gallery and ways for artists to apply for representation by The Art House Gallery. This will expand our online presence as a gallery, and in doing so, gives the participating artists the exposure they deserve, as evidenced by a prolific artistic practice.